We are delighted that you are thinking of getting married in St Benedict Biscop Church, Wombourne, especially as there are so many different choices available to you today. However, a church wedding offers you more than just a venue for your wedding; it offers practical care and concern for the whole of your married life together. Furthermore, with a church wedding there are various ways you can personalise the service so that it becomes your very special day. When organising a wedding there is always so much to do and things you need to find out. A wedding in church always raises questions so we hope the following frequently asked questions and their answers will help you in arranging your special day. Remember, if the following do not address a particular concern, feel free to contact the Parish Office who will be only too pleased to try and help you. Alternatively, send your question via the ‘Contact Us’ page. We have decided on a church wedding service at St Benedict Biscop Church, do we need to live in Wombourne? Ideally one of you will be a Wombourne resident and a regular member of the congregation which means you can readily get married in the church. If you do not live in the parish there may be what is called a ‘Qualifying Connection’. It may be that you were baptized or confirmed here or that your parents live in the village or come to the church. If you think you may have a ‘Qualifying Connection’ please speak to the Parish Office who will be pleased to advise you. Once a Qualifying Connection has been established you will be given a form to complete and return when you visit the Parish Office that asks you to give details of the Qualifying Connection. Alternately you can get married here by ‘regular attendance’. This is attending our Sunday morning 10.30 service at least once a month for six consecutive months. We would require proof of this and will give you a ‘Wedding Attendance Card’, asking you to have it signed by a Churchwarden each Sunday you attend and returning it to the Parish Office once completed. Only one of you needs to attend but it must be the same person each time – you can’t take it in turns! We would, of course, hope to see you both attending. Furthermore, your attendance must be completed before your Banns of Marriage are read. At St Benedict’s banns are called automatically at the 10.30 a.m. service on the first three Sundays at least two months before the wedding. Please do bear in mind that if you are unable to establish a qualifying connection then sadly we are legally unable to conduct your wedding ceremony at St. Benedict’s. One of us is divorced, what then? If either or both of you are divorced then you will need to contact the Parish Office whereby you will be given a ‘Marriage in Church after Divorce’ form to complete. On its completion return it to the Parish Office after which the Rector will arrange a meeting to discuss this with you. You will also need to have written legal proof that any divorce decree is absolute (a decree nisi will not be sufficient). Do bear in mind that the Rector is legally entitled to decide whether to marry you. The first thing you will need to do is contact the Parish Office to make an appointment when you both can call in to get things underway. At this meeting you will be asked for some basic details so that initial form-filling can be completed. Each of you will also be asked to provide proof of identity (e.g. a passport, picture driving licence etc) and proof of address (e.g. a utility bill, bank statement etc). If all is in order you will then be asked to pay a deposit. Unfortunately the Parish Office does not have the facility to process credit or debit cards so payment needs to be by cash or cheque. Cheques should be made payable to ‘Wombourne P.C.C.’. Do note that both of you need to attend this initial appointment as you each must provide proof of identity etc and each of you need to sign the necessary documentation. If there are any changes in your contact details then please let the Parish Office know as soon as possible. The Parish Office is situated in the Wombourne Institute, Church Road, Wombourne, WV5 9EZ (it is the cream building to the left of the church as you face the buildings). How do we contact the Parish Office? The Parish Office is open each weekday from 9.00 a.m. to 12.00 noon. You can go in person, telephone on 01902 897700, email office@stbenedictbiscop.org.uk or via the ‘Contact Us‘ form. It is probably best to telephone or email to make your initial appointment. What are Banns of Marriage and when are they called? Banns of Marriage are the public declaration of an intended marriage and therefore give anyone in the parish the opportunity to object to it if they have just grounds. 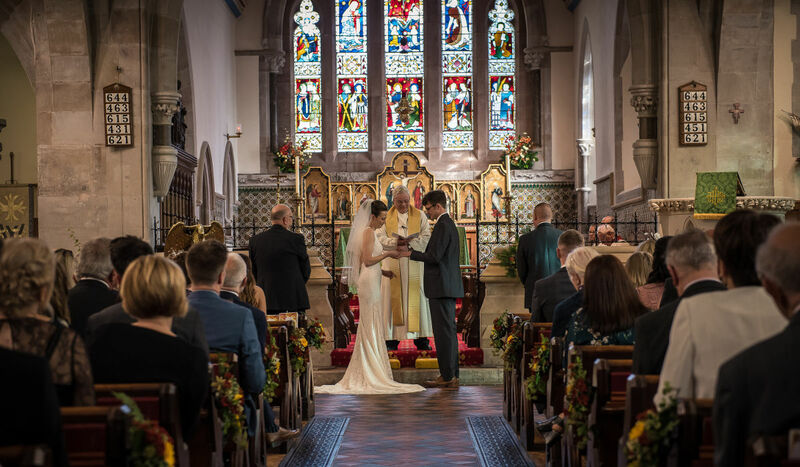 For couples marrying at St Benedict’s their banns are called automatically at the 10.30 a.m. service on the first three successive Sundays at least two months before the wedding. You should both endeavor to attend at least one of the services when your banns are being read. If one or both of you do not live in Wombourne then your banns will also need to be called in the parish or parishes in which you live. You can find your ‘Parish of Residence’ by going on to the internet and googling ‘A Parish Near You’. On bringing up this website go to ‘Parish Finder’ and type in your postcode. This will then bring up details of your parish and the parish church, so allowing you to contact the vicar who will arrange for your banns to be called on payment of the relevant statutory fee. You should arrange for this to happen at least four months before your wedding. After the third reading of your banns you will be given a certificate which will be required by our Parish Office at least one week before your wedding. Will the Church contact me about the wedding service? Yes, about three months before your wedding the minister who will conduct the service will contact you and arrange to meet you both to discuss all the preparations and details regarding your special day. It is helpful to have considered such things as the hymns and readings you would like, what you would like regarding flowers and whether you plan to have a photographer and/or videographer at the wedding. You can then discuss these things with the minister. Will we be able to choose the hymns for the wedding? 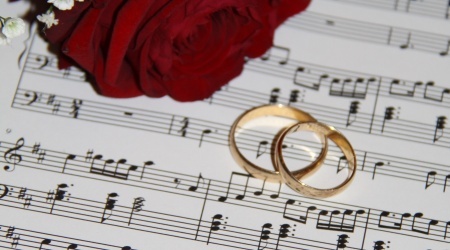 Music plays an important part in the service and usually there are three hymns at a wedding. You are therefore free to choose what hymns you would like and often you may have a favourite hymn or hymns that you wish to form part of the service. If not the website link ‘Suggested Hymns for a Wedding’ provides suggestions as to some of the main hymns that are often used. There are, of course, many others that you are free to choose. Will there be instrumental music during the service? Instrumental music usually features on four occasions in a wedding service. The first occasion when instrumental music is played is before the service actually commences and whilst guests arrive. Music is usually played for about fifteen minutes and you can either choose your own music or rely on our organist to play something appropriate. The second occasion when instrumental music is played is on the arrival of the bride and here you can choose a favourite piece of music you would like. 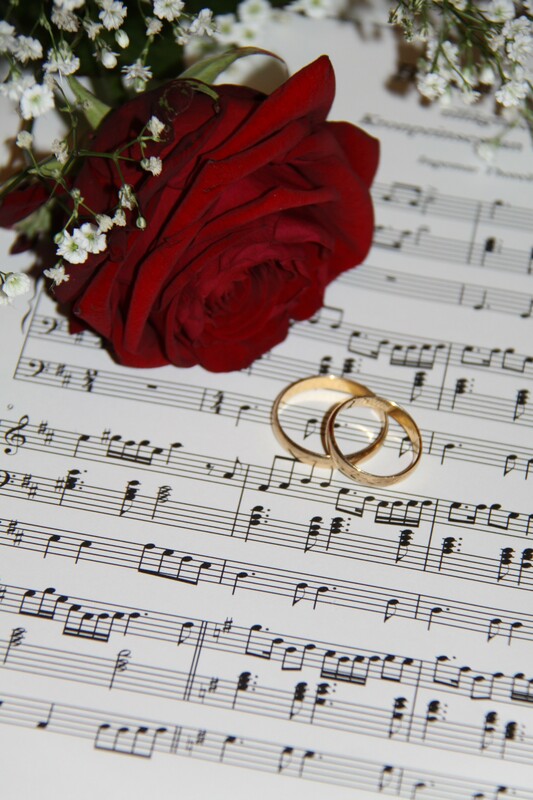 If not the website link ‘Suggested Instrumental Music for a Wedding’ provides suggestions as to some of the main pieces of music that often used at this stage of the ceremony. There are, of course, many others that you are free to choose or you may prefer the organist to suggest something appropriate or compose a special ‘arrival fanfare’, based on your own favourite piece of music or item. The third opportunity for instrumental music is when the register is being signed. At this stage organ music could be played, the choir could sing something appropriate or you may have a soloist who could sing or play. The organist can advise you on music that would be appropriate. Otherwise, if you have no personal preferences, appropriate music will be played and/or sung. As a guide the signing of the register, together with any photographs being taken, usually takes about six to eight minutes. Finally, instrumental music is played at the end of the service as you both walk back down the aisle and out of church. The website link ‘Suggested Instrumental Music for a Wedding’ provides suggestions as to suitable processional music for use at the end of the service, although many of the pieces highlighted regarding the ‘Arrival of the Bride’ also work well as processional music, especially the trumpet pieces. If you do have your own preferences for instrumental music then please be sure to advise the Parish Office well in advance of the ceremony so that the organist can be advised as there may be the need to consider its appropriateness or check that the necessary sheet music is available. What about a Bible reading during the service? There will be one, sometimes two, Bible readings during the service which you are free to choose. 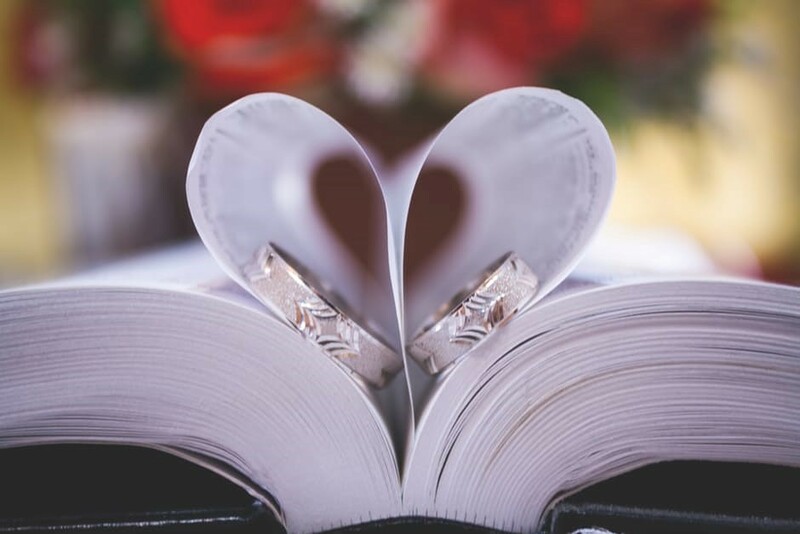 The website link ‘Readings from the Holy Bible for a Wedding’ provides some suggestions but there are many others you can choose. Flowers for your wedding are usually arranged the day before the ceremony with displays by the alter, at the chancel steps and in the porch. 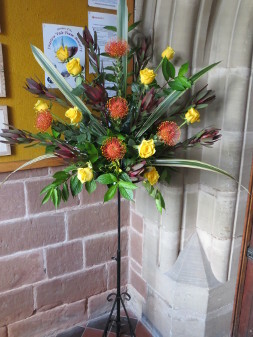 The church flower arrangers will do their best to meet your requirements regarding types and colours but bear in mind there may be more than one wedding on the day. Furthermore there are special rules relating to church flowers during Advent and Lent. 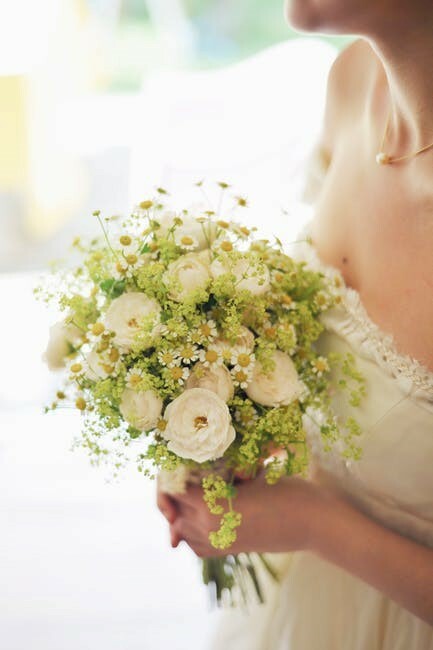 Mrs. Chris Welch, tel: 01902 324111, organises wedding flowers so please feel free to contact her if you have any special requests. 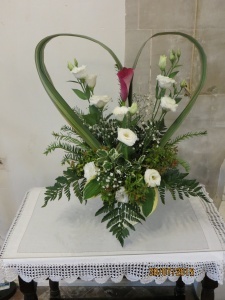 If you want additional or special flowers then Chris will be able to help and advise you of any additional cost. If you wish to have extra flowers and have arranged for a florist to display them then this is quite acceptable. However, you will need to arrange this with both Chris and the Parish Office. Furthermore arrangements will need to be made with the Parish Office regarding access to the church for both arranging and removing the displays. What is the usual format for a wedding service? Instrumental music will be played whist guests arrive followed by a further piece of instrumental/processional music as the bride arrives. Once the service commences the minister will welcome everyone and then a hymn will be sung. This is followed by the minister introducing everyone to the service, followed by a reading and then carrying out the actual marriage ceremony. A hymn will be sung after this, followed by prayers and a final hymn. After this the marriage register will be signed and instrumental music played. Once the service finishes there will be a further piece of instrumental/processional music as the married couple leave the church. What about an Order of Service booklet? Most couples prefer to have an Order of Service booklet so that their guests have a souvenir of the day. An example of the layout for a booklet can be provided by the Parish Office. Please make sure the size and type of font you use in the booklet is clear and easy to read. You do need to provide the Parish Office with a proof copy of your Order of Service booklet before it goes to print so that the minister can check it and ensure there are no mistakes. How will we know what to do in the service? 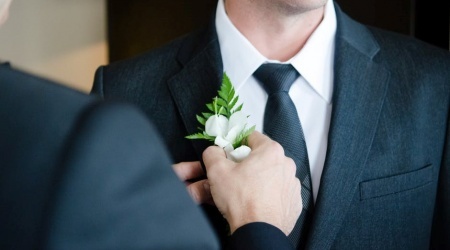 A rehearsal will be held before your wedding where everyone involved in the service is invited to attend. Usually this is held on the Thursday evening immediately prior to the wedding. What if I’m thinking of employing a Wedding Organiser? This is entirely up to you. All we would ask is that you let the minister and the Parish Office know as soon as possible and supply them with the name and contact details of the Organiser. What are the arrangements for photography and video? Obviously you will want reminders of your special day but there are some restrictions regarding photography and video during a wedding ceremony. The Parish Office will give you some forms which set out the necessary requirements that will need to be met which your photographer and/or videographer will need to complete and sign. These will need to be returned to the Parish Office well in advance of the ceremony. The photographer and/or videographer should ensure they introduce themselves to the minister before the ceremony; they are, of course, welcome to attend the wedding rehearsal if they so wish. Regarding the wedding ceremony, there are generally five occasions when photographs can be taken. Firstly photographs can be taken in church before the service. Photographs can then be taken of the bride as she begins the bridal procession from the church door. During the ceremony photographs can be taken provided no flash is used and that they are taken from the back of church, from behind the last guest. Photographs can be taken after the register has been signed and, finally, photographs can be taken as the wedding procession leaves the church. If it is wet then you may be able to have additional photographs taken in church. A video of the ceremony can be taken from the back of the church and a static unmanned camera can be placed near the front of the church by arrangement with the minister. After a wedding the photographer and guests usually want to take photographs outside the church. This is fine but we would ask that people respect the graveyard and that photographs are completed within thirty minutes after the service. How long is the service and what of timings? Most wedding services last for about 45 minutes. 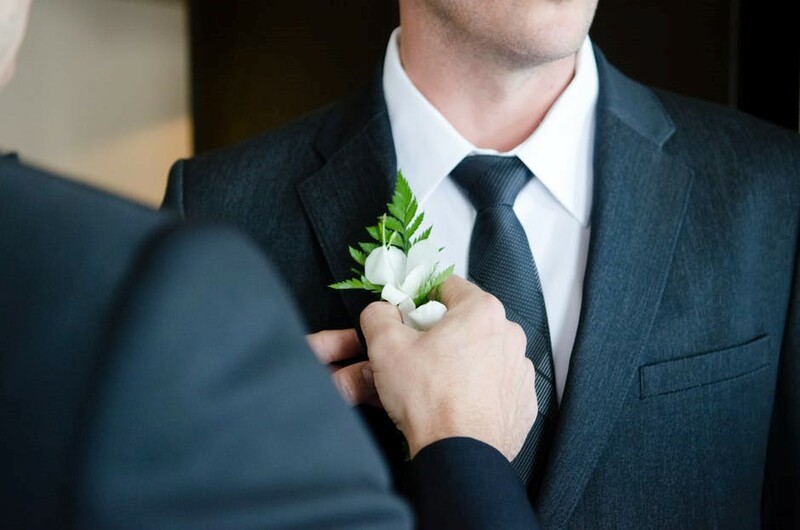 If you are having ushers who will look after your guests, issue Order of Service booklets etc., they should arrive about forty-five minutes before the ceremony. Ideally everyone, including the bridegroom and best man, should be seated and ready about ten to fifteen minutes before the service is due to start. A retiring collection plate will be placed at the back of the church if people wish to contribute to the work of the church, with Gift Aid envelopes available for those who pay tax. Where will people be able to park? The roadside outside the church will be coned off beforehand to allow the wedding cars to park outside the church. As far as your guests are concerned, they will need to be made aware that parking in Wombourne is limited so they should leave plenty of time to park. There is a small free public car park off the High Street and further free public parking behind the Civic Centre, Gravel Hill. Please note that the Wombourne Cricket, Tennis and Bowls Club car park, opposite the church, is private and for members only; a clamping system operates regarding unauthorized parking. Are there any facilities for young children? The tower room is available for young children and a carer if they become restless during the service whilst a toilet, equipped with baby-changing facilities, is available through the Lady Chapel. What about the cost of a wedding? Overall, weddings can be expensive. As far as a church wedding is concerned the cost will depend on what you want. There are basic fees that will need to be paid and which are reviewed every January. There are then optional, additional fees depending on what you require e.g. whether you want bells, the organ and/or choir (each attracts a separate fee). The Parish Office will advise you of current fees and send you an invoice about three months before the actual date of your wedding. This will need to be settled at least two weeks before your wedding and you can do this by sending a cheque, made out to Wombourne P.C.C., to the Parish Office at the above address. If it is easier for you, we do run a scheme whereby you can pay by installments and, again, the Parish Office can advise you about this. Can our guests throw confetti? Yes, it is a tradition to throw confetti over the newly married couple as they leave. All we ask is that bio-degradable confetti is used and it is thrown as you leave the churchyard, rather than round the church itself. How can we join in with the life of the church after we are married? You are encouraged to attend any of our services. Every Sunday there is 8.00 am Holy Communion and 10.30 am Parish Communion at St Benedict’s whilst at the Venerable Bede there is 9.00 am Parish Communion. Furthermore, at St Benedict’s there is 6.30 pm Evensong on the first Sunday of the month and 7.00 pm Taize Prayer on the second Sunday of the month. Please contact the Parish Office or complete the Contact Us form. We hope that you have found the above useful and that you will now have a better idea of what a wedding ceremony at St Benedict’s entails. If you then have your wedding in our church, we hope you have a very special and enjoyable day.